The US Navy will astound the world tomorrow by test-firing a radical new weapon system at an unprecedented power level. The new piece of war-tech on trial is that old sci-fi favourite, an electromagnetic railgun. According to the Office of Naval Research, which is in charge of the project, the electric cannon will deliver over ten megajoules of energy in one shot. 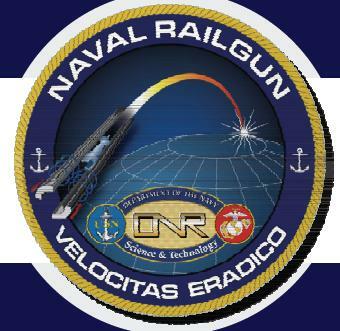 The ONR say this is “a power level never before achieved” by a railgun, and already represents significantly more poke than a normal five-inch naval gun can put behind its shells. Another triumph from the Office of Dodgy Mottos. The designers hope in future to get the technology up to 64 megajoule muzzle-energy levels, able to shoot hypervelocity projectiles at a blistering Mach 7 and strike targets two hundred miles away – still going at Mach 5 – with pinpoint precision. The US navy is interested in the kit for a number of reasons. For one, its next generation warships are expected to use electric drive systems, meaning that they will be have 80 megawatts or more on hand. If this power can be used to put violence onto the enemy as well as driving the ship, that’s good news for logistics and supply. The only ammo you need is solid shot with guidance fins; there’s no need for tons of high-explosive warheads and low-explosive chemical propellants for regular shells and missiles. These are replaced by nice simple fuel for the ship’s engines. The lack of exploding warheads could offer a chance to deliver more surgical strikes, too. They could take out a single vehicle from far out at sea, perhaps, rather than pulverising a whole area like present-day cruise missiles. This kind of thing is very trendy nowadays in military circles, though the problem of getting the right vehicle remains a tricky one. Furthermore, even the ritziest missiles struggle to get above Mach 3-4, especially over any distance; thus the railgun slugs would be quicker to arrive when bombarding shore targets. They might also be good for shooting down fast-moving flying things. Indeed, if the cannon could aim quickly enough and the hyper-bullets could steer well enough in flight, lighter-calibre weapons might tip the balance of naval warfare back in favour of surface craft. Ever since the Battle of Midway, sailors have reluctantly been forced to accept that aircraft win sea battles, not ships. But railguns might demote aircraft carriers from their current big-dog naval status and bring in electric dreadnoughts as the capital ships of tomorrow, able to sweep the skies of pesky aircraft or missiles as soon as they dared show themselves above the horizon. It’s easy to see why navies like the idea of electric hypercannons, then. But there are a lot of problems to be overcome. For one, the gun barrel tends to come apart after just a few shots. For another, packing a steady hundred-megawatt supply down into ultra-brief 64 megajoule pulses isn’t simple.